A group of impoverished, outcast artists living the bohemian life in Paris in La vie de bohème. 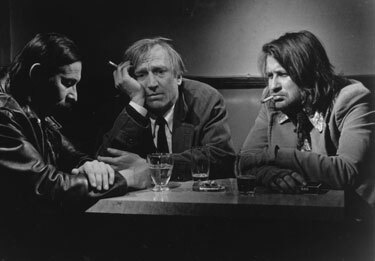 The 1992 film La vie de bohème by Finnish director Aki Kaurismäki (Le Havre, Leningrad Cowboys Go America) is a deadpan tragic-comedy about a group of impoverished, outcast artists living the bohemian life in Paris. Based on stories from Henri Murger’s influential mid nineteenth-century book Scènes de la vie de bohème (the basis for the opera La bohème), the film features a marvelous trio of Kaurismäki regulars, André Wilms, Matti Pellonpää, and Karl Väänänen, as a poet, painter, and composer who scrape by together, sharing in life’s daily absurdities. Gorgeously shot in black and white, La vie de bohème is a vibrantly scrappy rendition of a beloved tale and one of Kaurismäki’s most beguiling works. Blu-ray, DVD Release: Tie Me Up! Tie Me Down!